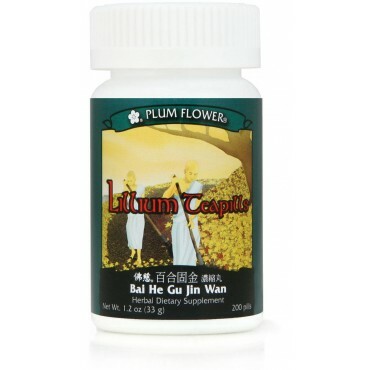 Deficient lung yin with heat causing unproductive cough or coughing with blood. Dry sore throat, difficulty breathing and low grade tidal fever. Dry cough that follows lung fire stage, deficiency dry cough following prolonged chronic illness; including tuberculosis and AIDS. Smoker's cough and whooping cough with little or no phlegm production are some of the imbalances satisfied clients have used this product for. Tonifies Lung and Kidney Yin, Cools and Moistens the Lungs, Clears Heat, Transforms Phlegm, Restores the Downward Flow of Lung Qi. Rehmannia glutinosa root-prep, Rehmannia glutinosa root-raw, Ophiopogon japonicus tuber, Lilium brownii bulb, Fritillaria cirrhosa bulb, Angelica sinensis root, Paeonia lactiflora root, Glycyrrhiza uralensis root, Scrophularia ningpoensis root, Platycodon grandiflorum root, Botanical wax, Talcum. - Shu di huang, Sheng di huang, Mai men dong, Bai he, Chuan bei mu, Dang gui, Bai shao, Gan cao, Xuan shen, Jie geng, Botanical wax, Talcum.